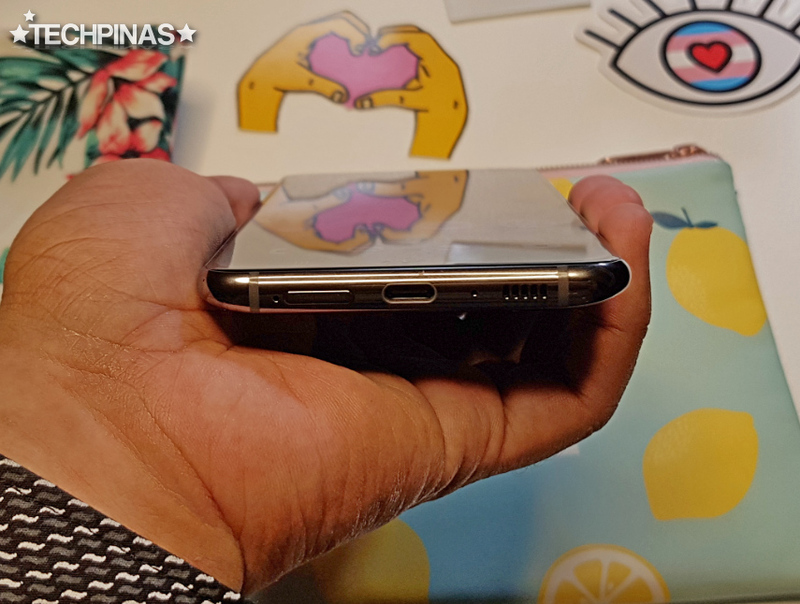 I've just arrived home from the local unveiling of the all-new Samsung Galaxy A80 and A70, which was held earlier - April 10, 2019, 8PM to 10PM - at Conrad Manila Luxury Hotel in Pasay City. 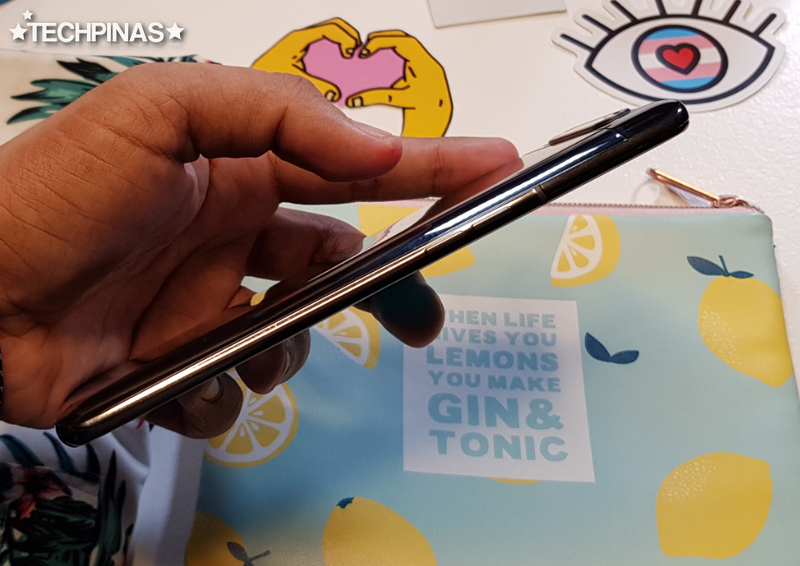 For those who missed the livestream, Samsung Galaxy A70 is practically just a larger and more expensive version of the best-selling Samsung Galaxy A50 released earlier this year. 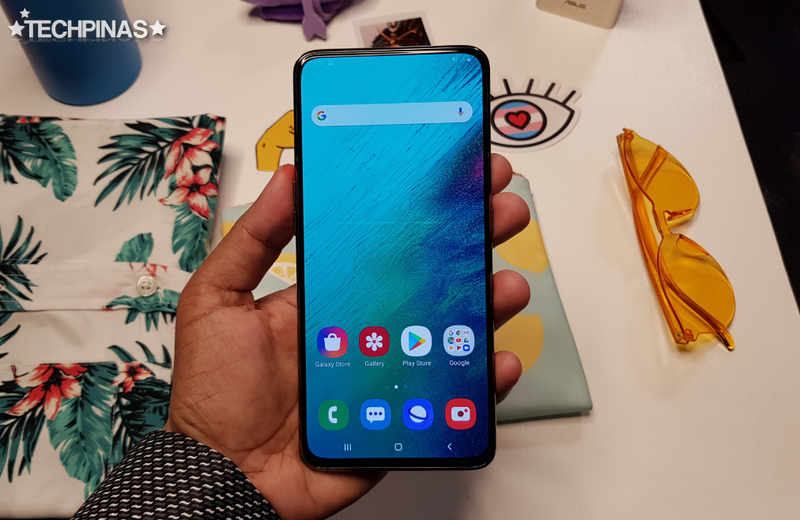 On the other hand, Samsung Galaxy A80 - which is shown in all the photos in this post - is the more exciting model as it represents many firsts in the Korean Giant's wildly popular Galaxy-A Android smartphone line. At first glance, the most striking feature of the Galaxy A80 would have to be its totally notch-free 6.7-inch FullHD+ SuperAMOLED Infinity Display, which has rounded corners and ultra-thin bezels. As I've shared before, many consumers hate the notch (no matter how small) with a passion because - according to them - that display feature takes away from the viewing experience instead of enhancing it. Samsung obviously listened to these mobile users and tried to come up with a fix to eliminate the notch altogether on this device. 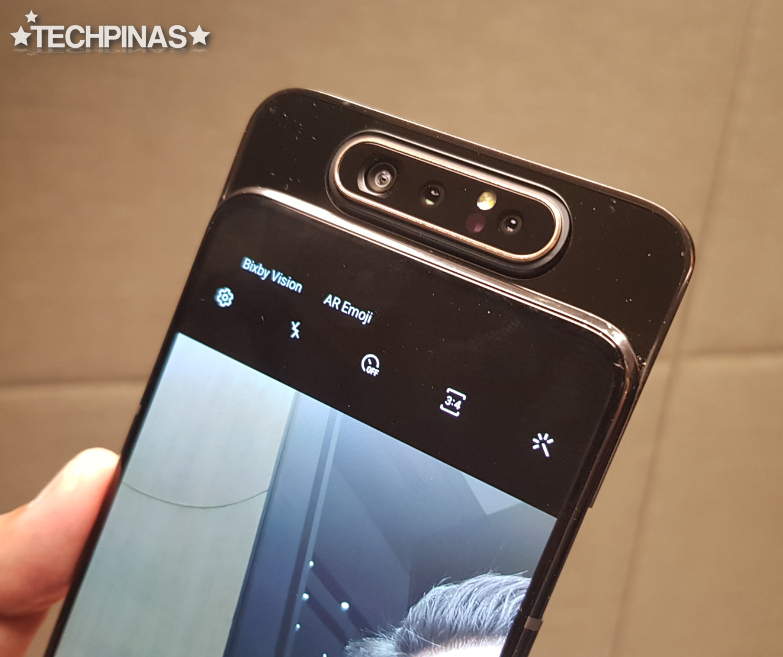 Launching Galaxy A80's camera application and switching to the front selfie snapper reveals Samsung's clever solution to the notch conundrum. 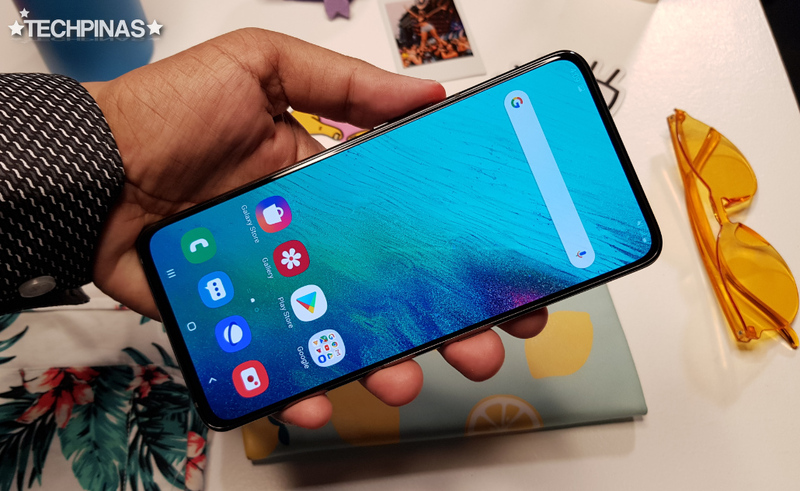 As you can see in the photo below, the Samsung Galaxy A80 features an elevating, motorized Triple Rotating Camera module, which is the first of its kind on a smartphone by the Korean company. According to Samsung, this innovative mechanism enables an intuitive imaging experience with the same set of lenses, front and back, so you never have to compromise on quality. The primary 48 MegaPixel camera with its large sensor and wide aperture lets you shoot clear and crisp photos day and night. The secondary 8 MegaPixel snapper has a 123-degrees wide-angle lens letting you capture landscape and group photos with ease. And finally, the tertiary 3D Depth camera offers Live Focus for both photos and videos by scanning objects' measurement and depth. This Triple Rotating Camera system also comes with intelligent camera features such as Scene Optimizer that can recognize up to 30 scenes and optimize the image based on that information. There's also Flaw Detection which automatically identifies glitches before you capture the shot so you’ll never miss the moment. 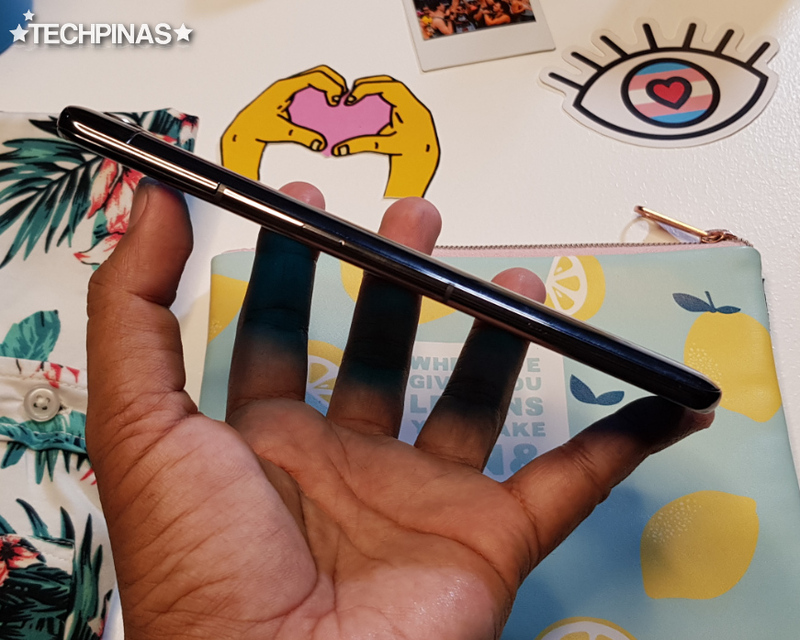 Aspiring vloggers and Youtube content creators would be delighted to know that the Galaxy A80 has Super Steady Video Mode that gives you smooth and steady looking videos even when you're just hand-holding the device while recording clips. Inside its sleek chassis, the Samsung Galaxy A80 runs its One UI customized Android 9.0 Pie operating system with a more than capable yet very resource efficient 8nm Octa Core Qualcomm Snapdragon 730 processor, which incorporates an Adreno 618 GPU for stutter-free mobile gaming. The chipset is complemented by 8GB of RAM for seamless multitasking - despite running multiple apps at once - and a sizable 128GB of internal storage. Oddly enough, this model lacks a microSD card memory expansion slot, making it the first Galaxy A-Series device not to have this useful feature. 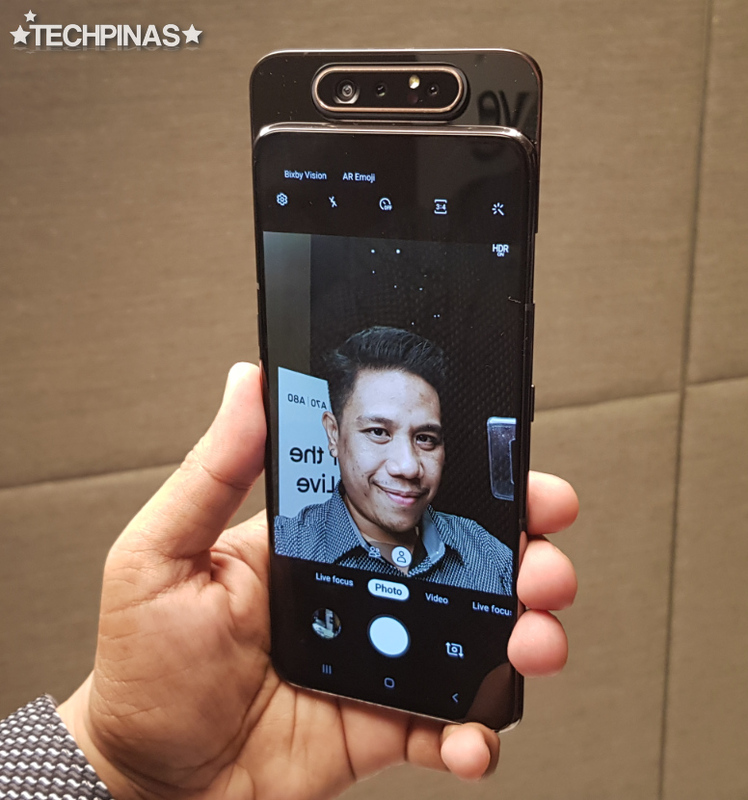 For those who are concerned about privacy and security, the Galaxy A80 supports Facial Recognition and even has an In-Display Fingerprint Scanner. Of course, it still comes with the familiar passcode and pattern unlock setting. All these help to protect the handset owner against those who want to view or steal private data stored in the phone including messages, photos, videos, and other important content. If you're a mobile warrior who hates plugging your handset to an electical outlet for multiple hours to fully charge it, you'd be glad to know that this model's 3,700 mAh Li-Po battery supports ultra-fast 25W charging via the USB Type C port. This means that you can spend less time charging the phone and more time using it for both work and play. Mr. DJ Koh, Samsung Electronics' President and CEO of IT and Mobile Communications Division said that the Samsung Galaxy A80 offers premium features for mobile consumers who want to fully engage in the Era of Live, allowing them to capture and share what they are truly passionate about. Interested in this powerful headturner? 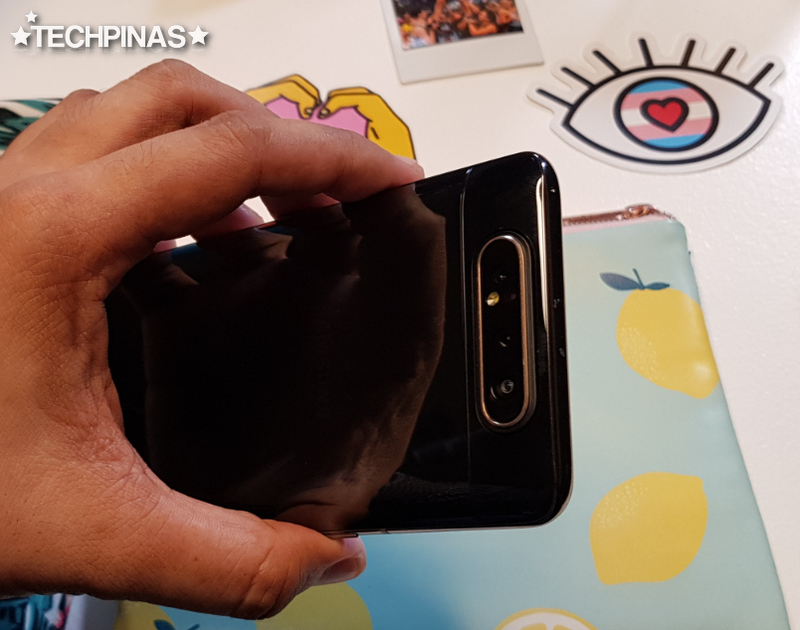 Samsung Galaxy A80 will be launched in many key markets around the world - hopefully, including the Philippines - on May 29, 2019. This unique cameraphone will be out in three classy colors, namely, Phantom Black, Angel Gold, and Ghost White; All having a high-gloss finish. 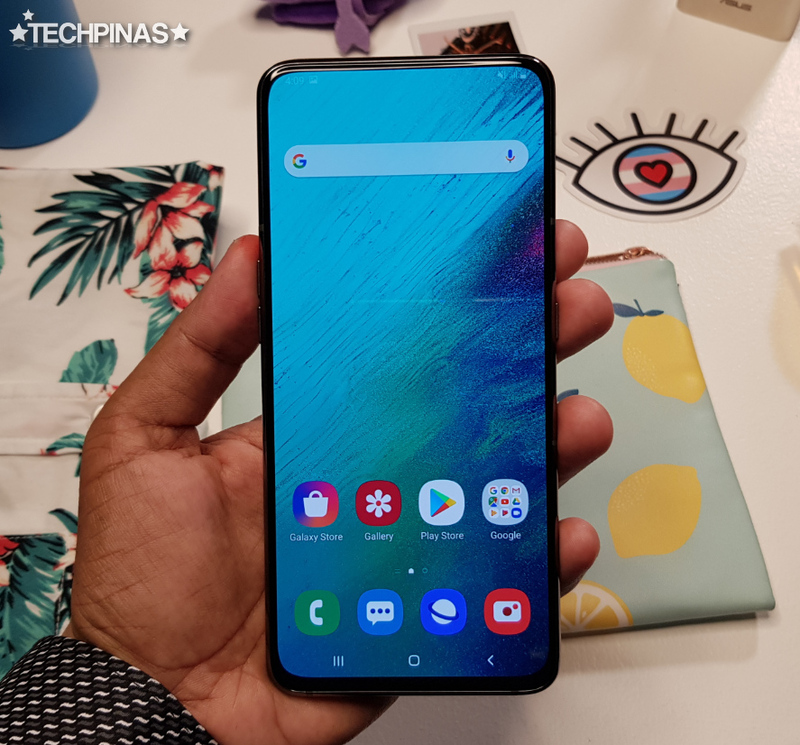 No word yet on the Galaxy A80's official suggested retail price in the Philippines. Stay tuned for updates!